EMILY CRAWFORD Autograph Letter Signed. Irish born journalist, war correspondent and the first female staff correspondent on a London Daily Newspaper. ALS. 3pp. The Nunnery, Saint Michael's Hamlet, near Liverpool. October 30th 1890. To [William] Woodall. Together with a fine contemporary portrait photograph. "I sent back the Miss Balgarnie letter. It would have crossed yours. Many apologies for the letter. 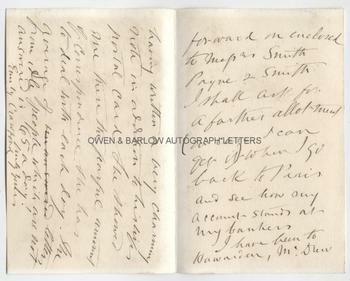 Would it be asking too much if I were to trouble you so far as to forward on enclosed to Messrs Smith, Payne & Smith. I shall ask for a further allotment (in case I can get it) when I go back to Paris and see how my account stands at my bankers. 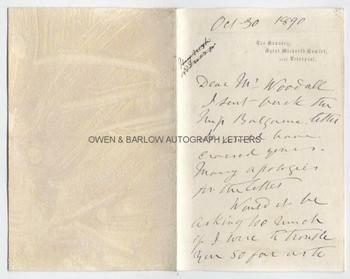 I have been to Hawarden, Mr Drew having written a very charming note in addition to his wife's postal card. She showed me there the fearful amount of correspondence she has to deal with each day. The average of ["unanswered" crossed out] letters from idle people which are not answered is 65 a day!" 8vo. Approx 7 x 4.5 inches. Mounting residue to verso of blank last leaf, else fine. 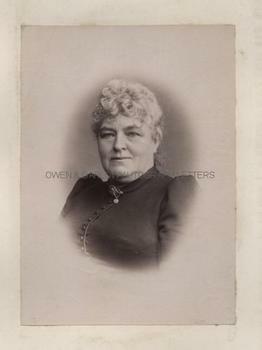 The portrait is a fine 19th century silver print photograph measuring approx 5.5 x 4 inches (excluding mount), laid down on card from album leaf. It shows a determined, strong looking Emily Crawford in head and shoulders vignette. It is in fine condition. Emily Crawford's reference to Miss Balgarnie refers to the campaigner for women's suffrage, Florence Balgarnie. Woodall was a leading supporter of the movement and, indeed, had introduced a Private Members Bill for the removal of voting disabilities on women. 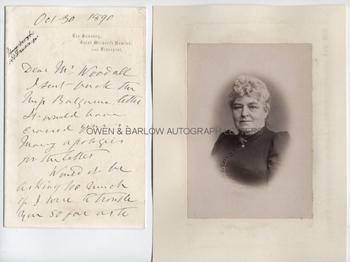 Mr and Mrs Drew are Mary Gladstone (daughter of Prime Minister W.E. Gladstone) and her husband. Mary Gladstone acted as her father's secretary in his later years and acquired considerable power and influence as a result. Emily Crawford had evidently been invited to the Gladstone's home, Hawarden Castle, where Mary had showed her quantities of letters that she had not dignified with a reply! Emily Crawford, nee Johnstone was of Irish and American parentage and after her father's death she went with her American mother to live in Paris, where she attended the Sorbonne. A letter to a friend was spotted by an editor and she was subsequently asked to send regular contributions to the London Morning Star. She soon developed a unique epigrammatic style of journalism. With her husband, George Crawford, she covered the Franco-German War (1870-71) and the Paris Commune (frequently going into dangerous and uncomfortable situations and invariably beating her rivals to the story). Emily Crawford went on to become the Paris correspondent on the London Daily News until her death in 1907, being the first woman to hold a staff appointment of front rank on a London daily newspaper. She also wrote for other newspapers, including the New York Tribune, the Pall Mall Gazette and Truth. She was the doyen of female journalists and an important and influential commentator. Emily Crawford may have met William Woodall during the Paris Commune, as Woodall was one of the first foreigners to enter the city during the siege and wrote a book about it after his return. The two, in any event, shared radical Liberal political views and Emily Crawford was an honorary member of the Cobden Club. Both the letter and the photograph are from a 19th century collection made by the radical Liberal M.P. William Woodall.